Sometimes you need to look up ! So as you may know at this stage if you have visited this blog before, I am rather obsessed with trees and pretty much everything to do with them. On occasion I do love to simply look up when I am in the middle of a cluster of trees and see what the world looks like way up there. I love the effect of a wide-angle lens on this kind of scene, everything seems to be falling in on top of me. It’s quite rare to see people wandering around looking up at the tree tops, I suppose it’s quite dangerous when you think about it. Personally it’s one of my favourite past-times, you just never know what you are going to spot up there. I love the massive tangle of branches, at times it’s hard to figure out which branches belong to which trees. I think this photo could make a great [and rather complex] game for kids, make them trace back each branch and work out which tree it leads back to. I know it would probably melt their brains but at least it would keep them quite for a while……….and before you ask, yes I do have kids. 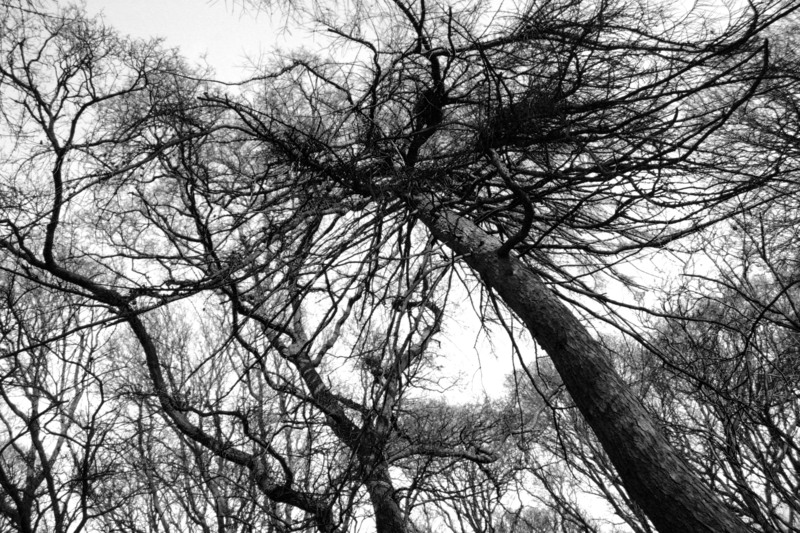 This entry was posted in Black and White Photography, Irish Landscapes, Phoenix Park and tagged Black and White, Phoenix Park, Photography, Tall Trees, Trees. Bookmark the permalink. ← This Deer Did Not Want Me Coming Too Close !